We wish you all a Happy Halloween week here at the Necrocasticon! Mr. Scott and Sgt. Dan are in the drivers seat again, taking us on a trip through metal and horror history, and dishing out our Halloween week picks for #HeavyMetalHorrorween. 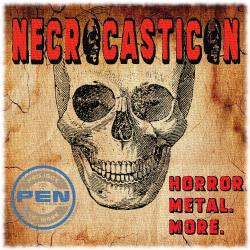 It's a very special chapter of The Necrocasticon this week as we welcome back one of the grandfathers of splatterpunk and extreme horror, Craig Spector. Volume 4 Chapter 21 looks for our missing Sgt Dan, forcing Tom and Walt to review HELL FEST and MANDY. We wish happy birthday to Blue Oyster Cult's biggest record and few other things as Scott delves into This Week in Horror & Metal History.